The parties discussed "all for all" prisoner exchange. In a joint statement of the four leaders, posted on Ukraine's presidential website, the parties reiterated their commitment to the implementation of the Minsk agreements in the sphere of security and on the political aspects of the settlement. 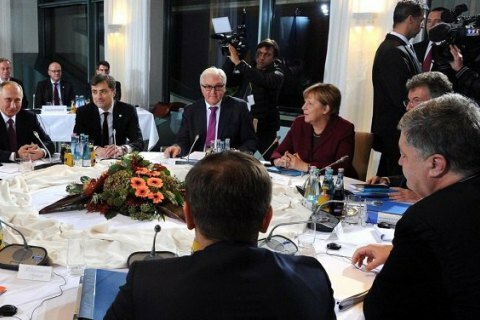 They welcomed the agreement on the resumption of the Easter truce, reached during the meeting of the Contact Group on March 29, and stressed the importance of its strict observance. "The Normandy Four leaders called for stepping up efforts to resolve the problem of exchanging prisoners under the "all for all" formula. They also expressed regret at the cases of threats against the OSCE Special Monitoring Mission," the report said. The leaders thanked the President of France, Hollande, for his efforts within the framework of the "Normandy format" and expressed the hope that this format will remain after the presidential elections in France. Last time, the N4 leaders met last autumn, although without much of success. On 14 April Putin's pressman Peskov said Russia was ready for the next negotiations on Donbas and said a Normandy summit could be held in the near future.